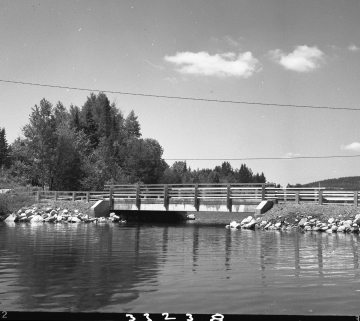 This image shows a bridge with guard rails that might be part of a causeway. It crosses over water, likely a lake, and has rocky slopes leading up to it. Beyond the bridge, there are coniferous and leafy deciduous trees. Completed Bridges - Pre-stressed Concrete, St. J, Wheelock, Sheffield, Charleston. CHARLESTON 2301(12) ECHO LAKE TH3 BR #23.